The Rajneeshees extend themselves into the community in an effort to sway public opinion and make some money. But now their enemies have easy access to them — a vulnerability that is violently exploited on July 29, 1983. 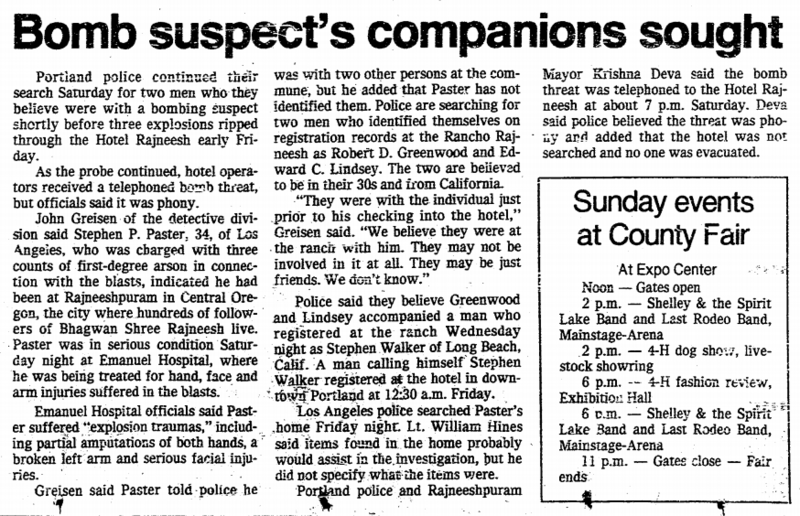 Much of today’s episode is adapted from the Portland Police investigative report on the bombing of the Hotel Rajneesh, which was included with the FBI file for Bhagwan Shree Rajneesh and obtained via a Freedom of Information Act request. Part 1 Part 2 Part 3 Part 4 (PDFs). The Rajneeshees collected many of their most successful recipes from their various enterprises into the Zorba the Buddha Rajneesh Cookbook. You can still find used copies of the cookbook online — I am the proud owner of a copy myself. They also published some recipes in the weekly Rajneesh Times newspaper. 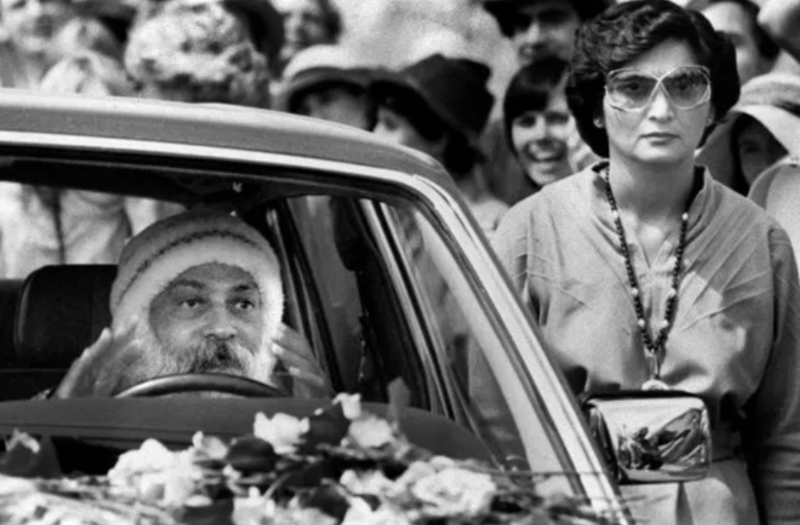 The story of the Sangam Rajneesh Sannyasin Ashram in Southern France is adapted from the Oregonian’s investigative series on the Rajneeshees, linked on the Sources page. Audio clips come from a 1982 KATU program hosted by Jack Faust, available on YouTube and worth watching in its entirety: Town Hall: Inside Rajneeshpuram (November 1982). Zorba the Buddha Restaurant in Antelope, Oregon. zorba the Buddha Rajneesh Restaurant and Nightclub, Portland. Plans for the Rajneesh University at Rajneeshpuram. We don’t know much about what Stephen Paul Paster did in Oregon before going to Rajneeshpuram. But there is an interesting interview in the police investigative file that may fill in some blanks. A man contacted police the day after the bombing, when he saw an image of Paster on the nightly news. He knew that man. He had talked to him a couple nights earlier, when Paster was with two other men… at a Portland gay bar called Chuckles. The men mentioned something about California, and made clear their dislike for the Rajneeshees. According to the witness, the men said something like, “We’re going to get them,” or “They’ve had it.” The witness said the men didn’t seem gay, but that there were “out for a fast buck.” The left the bar early that night and got into a yellow Volkswagen. He gave police a physical description of the three men. Now, maybe this witness knew enough publicly-available details to manufacture this story. But his statement came right after the bombing. And, frankly, for a gay man in 1983 to voluntarily approach the police and talk about his activities at a gay bar… I suspect he really believed he saw Paster and his companions at Chuckles. Just one week after the bombing of the Hotel Rajneesh, another serious threat to Rajneeshpuram played out. 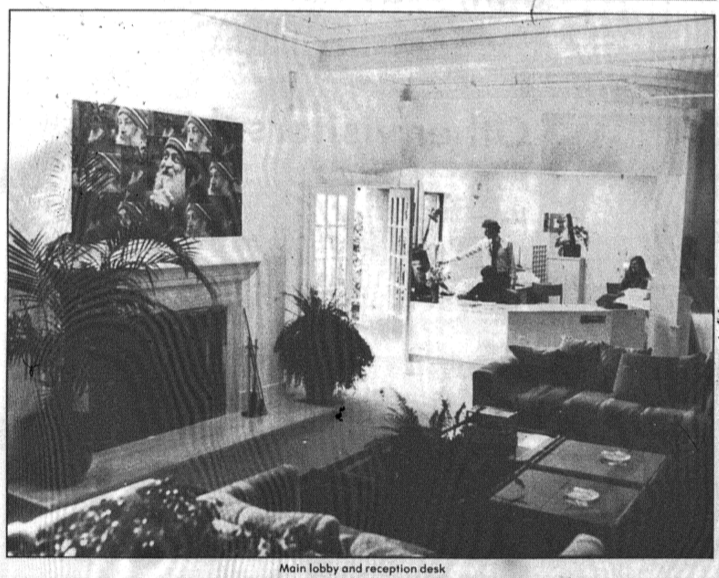 For a year leading up to that point, Sheela had been receiving threatening letters and audio tapes from a California man identifying himself as “El Rashid.” According to stories in the Oregonian and Rajneesh Times newspapers, El Rashid set up a meeting with Sheela to try to extort money from her, and when he arrived at the ranch on August 6, 1983, police officers arrested him. But I’ve found a draft affidavit (PDF) in the files of the Rajneesh Legal Department, written by Sheela, where she describes the events in more detail. Sheela says El Rashid was on her mind after the hotel bombing, because she had gone through a file of hateful letters to the commune. His letters were there, along with photographs of himself that he had included. 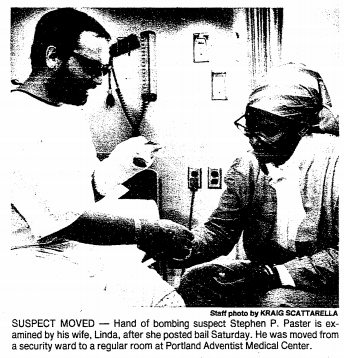 Sheela was standing outside the Zorba the Buddha Restaurant in Antelope one week after the hotel bombing when El Rashid and a younger companion pulled up in a car. Rashid followed Sheela into the cafe and sat next to her and kept talking to her about financial schemes that he wanted her to invest in. He said, I have chosen to come to you now because of the hotel bombing. I know because of the bombing that you’ll listen to me very carefully. Sheela tried to appease him by chatting for a bit, but the way he talked made her believe that El Rashid was perhaps schizophrenic and dangerous. He told her that he was armed, and that he had served 15 years in jail for bank robbery. When she tried to leave the restaurant, he insisted on meeting her the following day at the ranch to discuss his proposals. They set a 10:30 am meeting time. Back at the ranch, Sheela contacted the Wasco County Sheriff. El Rashid and his accomplice were arrested the next day. Two weeks later, they were released from jail when the grand jury declined to indict them. So there’s another possible explanation for Paster’s actions, one that some skeptical people — including Rajneeshees living at the ranch — whispered to each other at the time. Is it possible that Sheela and/or the Rajneeshees coordinated the hotel bombing? Based on everything I’ve seen, I don’t think that the ranch leadership had anything to do with the bombing. But let’s explore why that’s even within the realm of possibility. Remember way back to Episode 3, when we were wrapping up the Poona ashram years, and I told you that there was an assassination attempt against Bhagwan while he was lecturing in Hindi? A Hindu extremist had jumped up from the crowd, stormed toward Bhagwan shouting at him, and threw a knife that landed a couple feet away. Bhagwan urged everyone to stay calm, but just kept lecturing for another hour while the man was arrested and taken away. That would-be assassin was eventually acquitted, mainly because of Bhagwan’s reaction. If it were a true assassination attempt, wouldn’t he have been a little more rattled? Something about it smelled fishy. And remember Kate Strelley, the teenage girl who came to the ashram and ended up working in the Krishna House administration under Laxmi and Sheela? She states outright in her memoir that Bhagwan and Laxmi coordinated the attack. The attacker was paid. The reason Bhagwan sat so calmly when a knife was thrown at him — was because he knew it was coming, and that the knife would never get close to him. The purpose for this charade was to make the disciples fear for Bhagwan’s safety and increase their devotion to him. It also helped to inspire sympathy outside the ashram for all the hate being directed at Bhagwan and his followers. There are other examples of the Rajneeshee leadership allegedly staging attacks against themselves, like burning their own warehouses, pretending to have been attacked by outsiders, and more. If true, the Hotel Bombing could be seen as another example in that chain. It came at the perfect time for Sheela. She had been warning Oregonians for years that their efforts to block the commune’s development were nothing more than bigotry, and that it would eventually lead to violence. And then, lo and behold, there was violence — but not enough to actually hurt anyone, beyond the perpetrator. Maybe Stephen Paster didn’t bomb Rajneeshpuram because he was there collecting bombs from the Rajneeshees, to take to Portland. But I don’t think Sheela or others at the ranch coordinated the attack because (1) I can’t imagine why Paster would align himself with the Rajneeshees given what we know about him; (2) Paster seemed like a competent bomb-maker who bought at least some of the materials in Los Angeles; and (3) if the intelligence reports are right, he’s still a dangerous person working abroad.